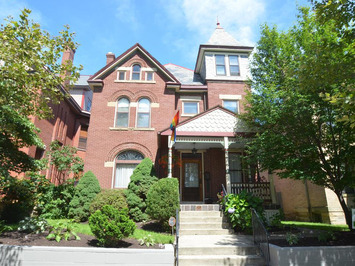 Spectacular 3 Story Victorian w/Turret! Absolutely Spectacular 3 Story Brick with Highest Quality Everything AND a Turret! Totally renovated & a quick walk to the Short North, Goodale Park & the Arena District! Fabulous architectural features. Gorgeous narrow hardwood flrs. Entry Foyer, open stair, Living Rm w/handpainted Artist mural above dec fireplace. Formal Din Rm could be Office/Den. Incredible Gourmet Kit w/oversized Maple cabs, huge natural Cherry Island, Granite countertops & high qual SS appls all wide open to large, fabulous Family Rm, perfect for entertaining and leading to huge deck & patio in newly landscaped, private yard. Three great Bedrms plus Laundry Rm on 2nd Flr, and an unbelievable Master Suite on 3rd Flr. Huge Sleeping chamber, Turret reading rm, Walk-in closet & phenomenal Mstr Bath w/huge walk-in shower! This one truly has it all! Absolutely incredible, wide Open Gourmet Kitchen with oversized Maple cabinets in "Alma Caramel"
3 more Bdrms, 2nd Flr Laundry, spectacular yard, this one has it all!